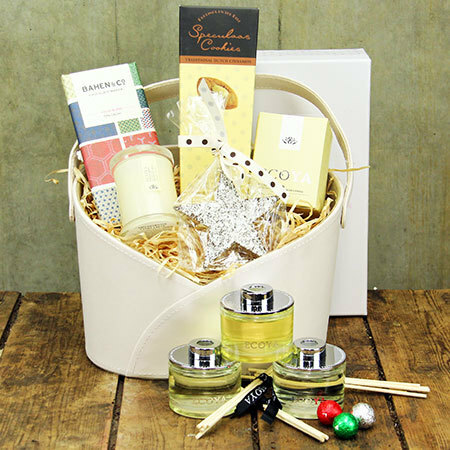 Beautifully presented in a re-usable cream `faux suede` look basket with leather trims and handle, this darling Xmas hamper is all you need for a relaxing night in after a crazy festive season. Starting with a beautiful Ecoya gift box featuring a trio of fragrant reed diffusers to place around the home, in Ecoya`s three most popular scents: French Pear, Sweet Pea & Jasmine, and Lotus Flower. Then the gourmet goodiesto relax on the sofa with, including European speculaas biscuits, Bahen & Co 70% cacao fair trade chocolate, and a divine chocolate star made by Yarra Valley boutique chocolate maker Kennedy & Wilson. PLUS if you order this Xmas hamper by the 14th December, you will also receive a FREE Vanilla Bean Ecoya soy wax candle (25 hour burn time) worth $19.95. This excellent value Xmas hamper brimming with quality gifts and stylishly finished with festive ribbon can be ordered via our online florist shop or by calling the Flowers Elves on 1800 66 66 46. *PLEASE NOTE: Xmas hampers delivered Sydney only. Hamper available for delivery from 16th November 2015.